Wow, March really flew by, didn't it? I can't believe it's April already. Fortunately, I managed to keep up with my quilt block commitments! Granted, it's not perfect. I am sure you can find the flaw without too much effort, but after two failed attempts, I don't really care. I'll take it! Now on to some new blocks. This first one isn't for a quilting bee, but for a special project that's been organized over on Flickr. I can't share too much more about it yet, but I will soon ... promise! Anyhow, I was tasked with making an improvisational block in shades of yellow. It turned out to be a pretty cute block! So what did you work on last month? I'm loving everything about your stacked book blocks. lovely. I love that green block! I really like those blocks, especially the last one with the green. 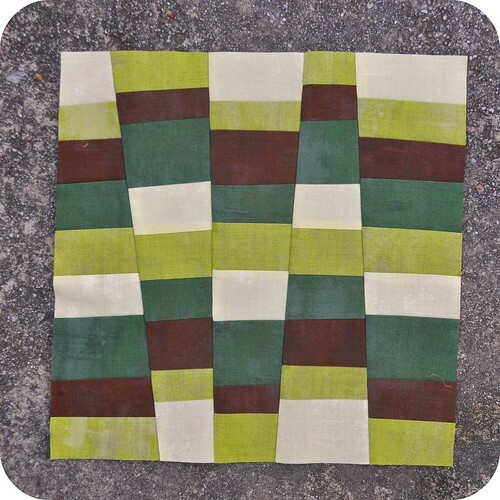 I've started an Oh Fransson quilt for my bed. Nothing like a fresh paint to inspire and light the fire. The room is painted and the bed is begging for its new wardrobe. I really enjoyed making the stacked blocks for March, and I just finished your Shoo-Fly blocks for April. They were really fun, too. 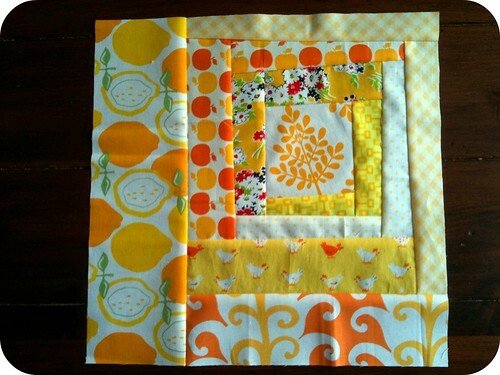 Also, your yellow improv block is gorgeous! being a British girl myself, I'd say your Union Jack is pretty much perfect! I participated in the TQS Sensational Strippers Exchange by cutting and mailing 150 (1 1/2" wide x 22" long) batiks strips--no more than 10 of a given fabric, so I used 15 different batiks. 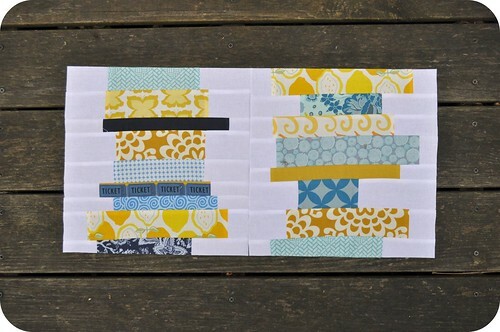 This improv block might be a good use for the strips. I was sewing, then my machine went wonky, so waiting to get it back. You don't realize how much you need a sewing machine till you lose it and have to use an old clunker, lol. I think you should only worry about errors in a union jack if it's going to go on a flag pole :) love that green block you did from the tutorial, really striking! Union Jack looks Great! I have a king size one I did (with much difficulty) but after three of them I'm a pro!! I just stumbled across your blog. Love to see gentlemen enjoying the quilting world. I have quilted for years, but I still consider myself between a beginner and intermediate, there are still many things I need to learn. I love your stacked block and Rachel's. Lots of fun! 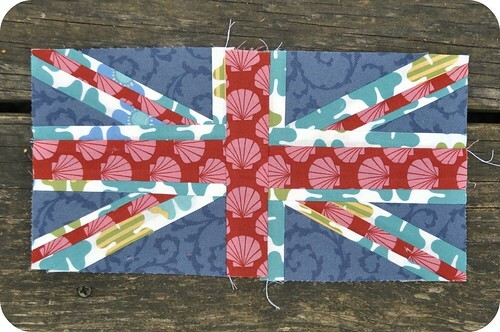 Mmh, I do like the Union Jack block, the only problem I see is that it is a mirror image. That is one of the problems with foundation paper piecing. 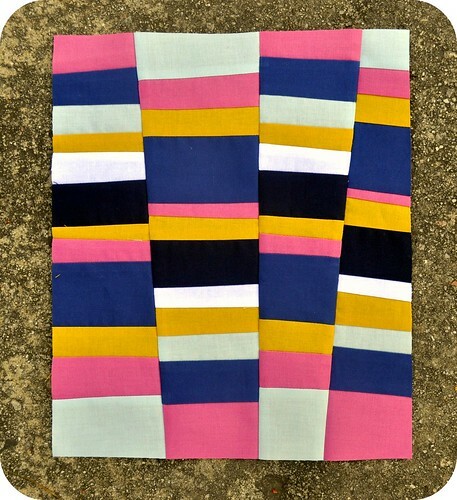 My favourite style of fabric is civil war, but your fresh bright easy style blocks tempt me in a big way. I love to read your blog to see the modern fabrics that you use. The pink,yellow, blue, and white is awesome. hi there! I stumbled across your blog a while back when hunting for some unique quilt ideas. 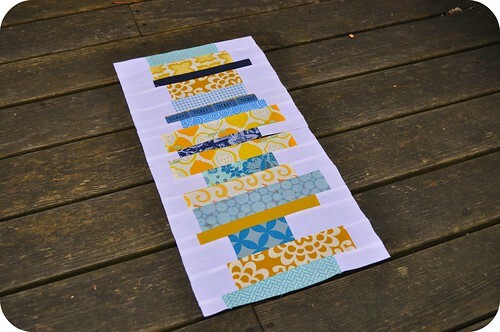 I just love your fun modern take on quilting. I'm currently working on my third quilt for my 3.5 year old daughter. She is deeply in love with Wall-E (disney pixar movie) and I wanted to make a little blanket for her. It has morphed into a twin sized comforter! I made the pattern myself and am pretty impressed with myself. :) I don't have a lot of experience with a sewing machine, just a crafty nature and a slightly deranged imagination that says, "oh yeah, I can do that!" it's all pinned together and waiting for time to quilt...I've never done the finishing of a quilt either. eek! but I've got my mom's 20 year old white machine, a walking foot and a darning foot. off I go! I loved the blocks too! !